It largely sounds like a socialist mantra, but this may be the first time someone tried it. 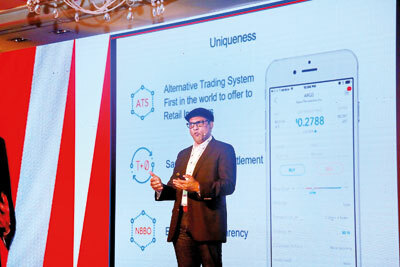 Tony Weerasinghe, Sri Lankan founder of software company MilleniumIT that helped rebuild the London Stock Exchange’s core trading technology, re-launched his new company, low-cost US online retail brokerage Ustocktrade. When we say re-launch, there certainly is a story behind it. Ustocktrade is a revolution of customs in the way people trade. “All exchanges carry out trading, but how many put the small timers on top?” was Tony’s question when he started out. Only 1 per cent of the world owns 50 per cent of all wealth. Not fair. But what do you do? So Tony started studying this 1 per cent. “All of them own stocks,” he says to the Business Times in a recent interview in Colombo, during a frequent visit from his current overseas base. He noted that it’s much more to do with the opportunity that’s given to this 1 per cent which is then exploited. The rest don’t have this. They are tbe small guys. Most small timers and retailers want to complicate things and they are generally frightened to trade as they feel that they need great financial acumen to trade in stocks, he says. Also the ‘big’ advantage that small timers don’t have is margin trading. “This allows you to buy more stock than you’d be able to normally. Buying on margin by borrowing money from a broker to purchase stock is really a loan from your brokerage. To trade on margin, you need a margin account. So the ‘rich’ are actually earning on other people’s money (which translates into large credit facilities). But the small timers need to maintain a minimum size in cash to leverage on cash which automatically places them at a disadvantageous position. “How do I give the small guys the same chance as the rich ones so that they don’t need to borrow money or open a margin trading account? Ustocktrade germinated though this idea,” Tony says. Settling a transaction requires a long time, he remembered. A transaction is settled within T+3 (trading + three days) in many exchanges, but by settling retailer transactions in real time, Tony realised that he can place them at the same position as the rich boys who trade on margins. So he created an Automated Trading System (ATS) solely for retailers in the US. ‘It’s an alternative trading system where the value of orders is capped at US$ 10,000 and high frequency trading firms are kept out. It’s real time. There’re no T+3 when settling a transaction. It’s critical “to really understand your time horizon,” he says adding that it’s also important to really understand that in the short or intermediate term anything can happen and market crashes can occur. This way the small traders can earn money as well. He says that everyone is aware that retailers are being played out, but no one wants to dig their heels and say or do anything to stop it. Tony Weerasighe addressing the Asian Business Angels forum in colombo recently. This ATS needs 20,000 users to break even and Tony says that they did that in six months. “We were at the sixth place in exchanges in the US from the 35th place at the start in six months.” There are 35 exchanges in the US to begin with, he says laughing. With this kind of profits people were beginning to take notice. Ustocktrade is one which generates revenue from a one-dollar-a-month membership fee and a one-dollar-per-trade fee. All bells were ringing in the industry. There are no investors, no capital infusion from outside and this is an exchange with members and a membership fee. How was this possible? Part of Tony’s goal was to encourage non-traditional investors, such as university students and low-income earners, to take part in the stock market. Tony’s aim to “bring Wall Street to Main Street” really worked that the Financial Industry Regulatory Authority (FINRA) knocked on his door after the company had broken even. “I got offers for this company in three months. These were 6 to 7 times more than the MilleniumIT transaction many years ago. It was beyond comprehension. But I refused to sell because this company was started for charity. This is the first Wall Street company that was started for charity.” His refusal to sell perpetrated in ‘if you can’t buy them destroy them’ mindset. FINRA had wanted to conduct an audit on the company. Why? Because their volumes were very high. Tony says that the regulators spent three months auditing the company. “I had eight staff but there were 20 regulators. I had office space only for my eight staff members. So I had to buy them office space to conduct the audit,” he laughs. Then they wanted him to change the model. He said no. They said that in that case the company has to wrap. So he went to courts. He went to courts against the Securities and Exchange Commission of the US and the Feds. He won. So what happens to the profits? Tony says that as promised, the firm will help fund a non-profit organisation called the Cainan Foundation set up to build schools for disadvantaged children and profits from the brokerage will fund the foundation’s first school in Sri Lanka. He acknowledges that Sri Lanka has had a bad experience in the past with the stock market. “The stock market isn’t a bad place. There are only a few bad people.” With this new app on Ustocktrade, he says that retailers will gain confidence. He adds that the company’s future plans are to go to countries and connect nations.